Each year, we recognize the contributions of individuals and corporations who give generously of their time and resources to help the Foundation support public education in La Crosse. 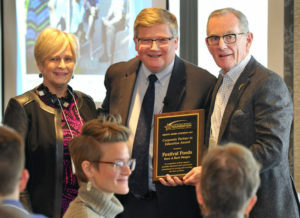 The following awards were presented on Jan. 18, 2019 at the Foundation’s Grants Award Luncheon. 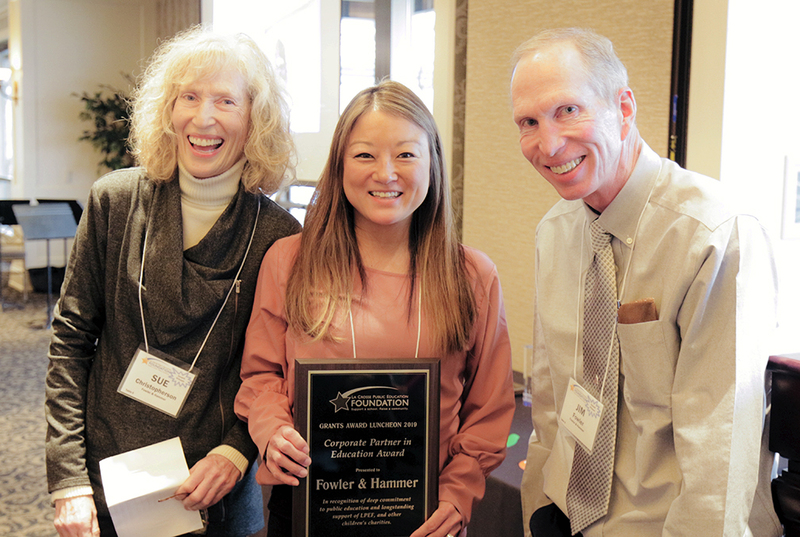 For its deep commitment to public education and childrens’ charities, LPEF presented its 2019 Corporate Partner in Education Award to Fowler & Hammer. For more than 55 years, Fowler & Hammer has been helping build our community and many others throughout the Midwest – serving as a general contractor on public buildings and schools, offices and retail space, health care facilities, industrial plants and even churches. But the company’s work goes much beyond high-quality construction. They have been laying a different kind of foundation – providing a great place for people to work, offering customers the special attention each one deserves, and helping improve the quality of life in La Crosse and beyond. In particular, Fowler & Hammer has been a great friend to education and a supporter of childrens’ charities. The company and its leaders have been consistent supporters of the La Crosse Public Education Foundation and the La Crosse schools, donating funds to support everything from Gold Star Grants, to the start-up of the AVID college readiness program and recently to help pay the cost of Spanish-speaking interns at North Woods International School. 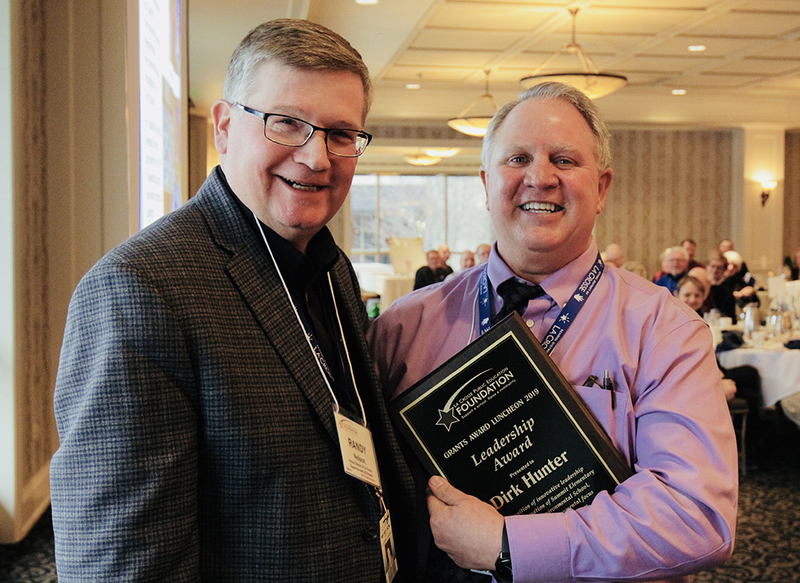 For his innovative leadership in the transformation of Summit Elementary into Summit Environmental School, the Leadership Award was presented to Dirk Hunter. It is hard for words to capture the energy and enthusiasm that Dirk brings to his job as principal of Summit Environmental School. Even while battling health issues in recent years, he has brought a unique blend of ideas, vision and passion for educating young children to his job at Summit, where he has been principal since 1992. Those who worked with Dirk in developing and implementing a vision for an environmental school at Summit can testify to all of the extra effort he gave to building a staff and exploring new collaborations with the community, including seeking out critical grant funding. Dirk is a leader of leaders, providing a model of excellence for his colleagues throughout the School District of La Crosse. He is a strategic thinker and a gifted educator who senses what is needed and frames up a plan to make it happen. Perhaps most of all, he demonstrates a genuine love of students and the people around him – and has a unique ability to find some fun and humor in it all. In accepting the award, Dirk said: “Any time we receive any personal success, it’s really a reflection of so many people that supported us along the way.” He told several humorous stories about past colleagues and saluted many staff members who joined him for the celebration. 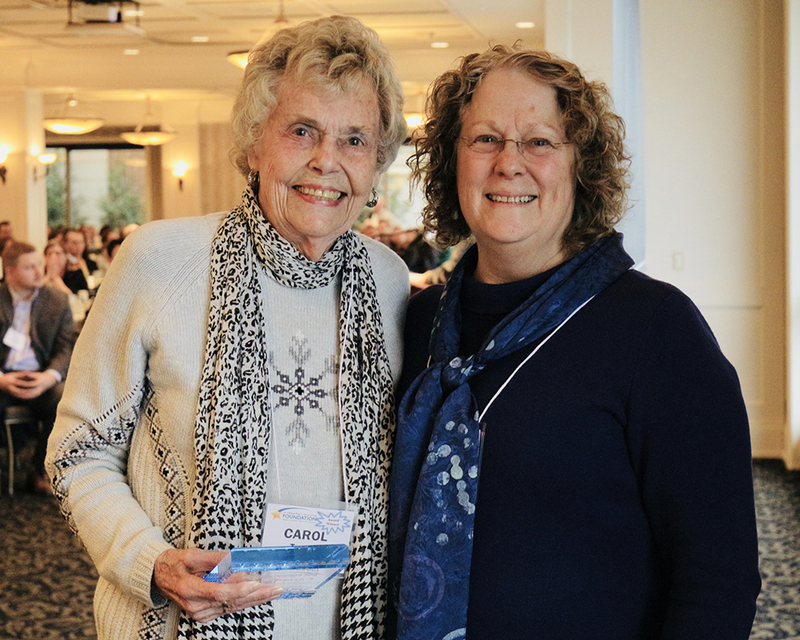 Carol Taebel, left, receives the Distinguished Service Award from its namesake, Margaret Dihlmann-Malzer. 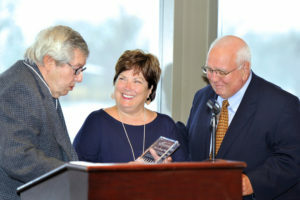 In recognition of her passionate support for teachers – and for her service to the community and LPEF – the 2019 Margaret Dihlmann-Malzer Distinguished Service Award was awarded to Carol Taebel. When Carol Taebel was growing up in the Chicago area, she says she had a wonderful 4th grade teacher named Mrs. Kelly. For years afterward, Carol wanted to be a 4th grade teacher. She fulfilled that dream and became an elementary school teacher, including 15 years at Harry Spence Elementary School in the School District of La Crosse. She taught 3rd, 4th and 5th grades …. but she’s quick to say that teaching 4th grade was always her favorite. As Carol says, in 4th grade, the students still love their teacher. Although she retired some time ago, Carol never gave up her love for teaching or teachers. Her family fund at the La Crosse Community Foundation provides funds for an annual grant awarded to a school, with a preference for projects at Spence, where she taught. In addition, for the past four years, Carol has been supporting LPEF’s annual Thank a Teacher Day event, paying the cost of delivering baked goods and fresh fruit to nearly 1,000 district employees across 15 school buildings on that day. Now Carol has set up a new permanent designated fund at the La Crosse Community Foundation called the Carol Taebel “Thank a Teacher” Fund. It will generate an annual grant to LPEF to be used in supporting teacher appreciation activities, such as the annual Thank a Teacher Day. Carol has been an inspiration and volunteer contributor to many causes in the La Crosse community, including serving as Mrs. Oktoberfest in 1986. Her daughter, Heidi Morris, is an English Language Learners teacher at North Woods International School. Her son, David Taebel, teaches at Holmen Middle School. A third son, Scott, is a Milwaukee-area attorney. Carol and her husband, Duane, who passed away in 2005, moved to La Crosse when he became a gastroenterologist at Gundersen Health System. The following awards were presented on Jan. 22, 2018 at the Foundation’s Grants Award Luncheon. Coulee Bank has been a strong partner with the La Crosse Public Education Foundation since its inception nearly 30 years ago, and one person has been there throughout that time. 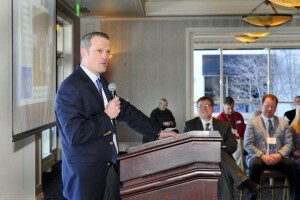 Chief Executive Officer Brad Sturm was an early Board member of LPEF, joining the Board in 1990 and serving six years, including the last three years as treasurer. 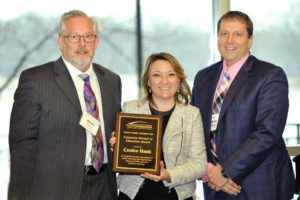 Brad was succeeded on the Board by a series of Coulee Bank leaders, including: Dirk R. Gasterland (1996-1998); Tim Kolek (1998-2003); Libby Berg (2009-2012); and most recently Tammy Larson (2013 to present), who is a past president and current treasurer of LPEF. Coulee Bank started in 1961 with one branch in La Crosse, and has now grown to five branches, located in La Crosse, Onalaska, Holmen, Rochester, and St. Paul, Minn.
Coulee Bank is a consistent supporter of LPEF, including sponsoring this luncheon, and also as a past presenting sponsor of the Bowtie Classic. In addition to its exemplary support of public education, Coulee Bank supports a number of children’s charities, including: Big Brothers Big Sisters of the 7 Rivers Region; Junior Achievement; Boy Scouts of America; Girl Scouts; Stepping Stones; Toys for Tots; Family Service of Rochester, Minn.; Hiawatha Homes in Rochester; and the East Side Learning Center in St. Paul, Minn.
Joe Ledvina is a steward of taxpayer dollars, and a champion of public education. 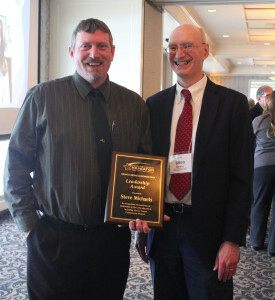 He earned the 2018 Leadership Award for his dedication to maintaining and improving buildings and grounds in the School District of La Crosse, and for his fundraising efforts on behalf of the La Crosse Public Education Foundation, most notably in support of the Charlie Miller Bowtie Classic & Knowledge Open. Joe joined the District in 2001 and was promoted to be Supervisor of Buildings and Grounds in 2008. Among other projects, he oversaw construction of the first new school building in La Crosse in 20 years, culminating in the dedication of the $15.7 million Northside Elementary School in Fall 2014. His department is responsible for 14 school buildings, plus administrative and storage facilities, and is dedicated to providing a safe, caring, and well-maintained environment for students, staff, and the community. A native of Bettendorf, Iowa, Joe married his high school sweetheart, Nancy, and they will soon celebrate their 35th wedding anniversary. After serving in the U.S. Air Force, Joe and Nancy moved to La Crosse and Joe completed his degree at UW-La Crosse. He worked at Gundersen Lutheran Medical Center before joining the District. Joe and Nancy have three children, Stefanie, Stacie, and Ryan — all proud graduates of the La Crosse public schools. The couple has two grandchildren and is expecting a third in February. Joe was elected to three terms as District 15 representative on the La Crosse Common Council and served as Council President before resigning in 2008 following his School District promotion. Joe also has served on many community boards and professional committees, including being co-chair of the Wisconsin Association of School Business Officials Facilities Committee, and also as State Road Elementary PTO president. Retired Superintendent Richard Swantz presents the Margaret Dihlmann-Malzer Distinguished Service Award to Judy and Tom Sleik. 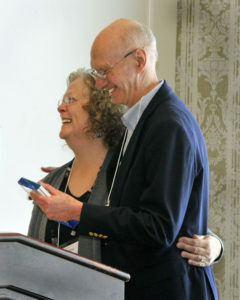 Since the inception of the La Crosse Public Education Foundation in 1988, Tom & Judy Sleik have been among the most key, and most loyal, supporters. For their longtime service to LPEF and to the larger community, they were recognized with the 2018 Margaret Dihlmann-Malzer Distinguished Service Award. Tom, now an attorney emeritus with the firm of Hale, Skemp, Hanson, Skemp & Sleik, drafted the articles of incorporation and other founding documents for LPEF in 1988 and 1989. He was elected to the original Board of Directors and served five years. His dedication to public schools includes a stint on the Board of Education (1973-77), and even one year as president of the State Road Elementary PTO. He also has a long track record of other community service, including being Campaign Chair of the Greater La Crosse Area United Way, and President of the Gateway Area Council Boy Scouts of America. He is a current member of the Board of the La Crosse Community Foundation, and was the 2001 Oktoberfest Festmaster. Judy was an elementary school teacher with the School District of La Crosse for 22 years before retiring in 2008; almost all of her time was spent as a 5th-grade teacher at Emerson Elementary. 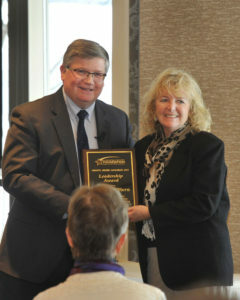 She has just completed six years as a Board member of LPEF, including four years as Board Secretary. Tom and Judy’s daughters, Jennifer, Julia and Joanna, all attended State Road School, Lincoln Middle School, and Central High School. They graduated in 1988, 1991, and 1994 respectively. The following awards were presented on Jan. 16, 2017 at the Foundation’s Grants Award Luncheon. 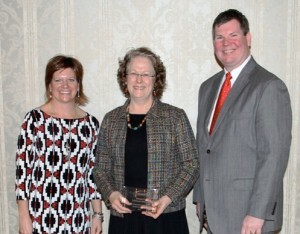 The La Crosse Public Education Foundation’s Corporate Partner in Education award is presented annually to a business with a deep commitment to public education in our community. Festival Foods is a most deserving recipient — and that’s in large part due to two very special people, Dave & Barb Skogen. Festival Foods shows its commitment to the community in so many ways, and the School District of La Crosse has been a major beneficiary of support. That includes helping LPEF with its classroom grants and other programs. Festival and the Skogen family have provided funding for AVID, for the Equity Institute, for the field turf project at Logan High and for many other projects. Dave Skogen has gone out of his way to help with other events – even providing brats for all of the staff last fall at our back-to-school welcome. In addition, Festival and the Skogens support other area schools and many critical charities, such as the Boys & Girls Club; Family and Children’s Center; La Crosse Area YMCA; Boy Scouts; and the list goes on and on. They give both of their time and treasure. The Leadership Award is presented annually to an individual who has demonstrated great service, passion, and leadership in support of our public schools. This year’s recipient is Annette O’Hern. Annette joined the School District of La Crosse in 1988 as a business education teacher at Logan High School. She served for many years as the District’s School-to-Work Coordinator before becoming Supervisor of Career & Choice Education in 2013. She has just completed her second term on the Board of the Greater La Crosse Area Chamber of Commerce. Annette was instrumental in partnering with Gundersen Health System, Mayo Clinic and others in creating the Health Science Academy, which is now in its 8th year and includes more than 100 students from eight different area high schools. She is passionate about many things, but perhaps none more than the Health Science Academy partnership with Gundersen Global Partners – which has grown to include a special relationship with three tribal schools on the Pine Ridge Indian Reservation. When you travel with Annette to Pine Ridge, you see the love she has for the people there – and the love they have for her. This award is presented in recognition of service to the community and to the La Crosse Public Education Foundation. The 2017 recipient is Gregory Bonney. For those of you who have served on nonprofit Boards, you all know the value of a Board member like Greg Bonney. Smart. Committed to the mission. Always willing to step up to help – whether it be serving chili at the Chili Cook Off, dodging golf balls at the Bowtie Classic, or overseeing the Board and organization during a time of transition in leadership. Greg grew up in Prairie du Chien and graduated from Luther College, before receiving his law degree from Hamline University School of Law in St. Paul. He joined Johns, Flaherty and Collins in 1987, where his practice consists primarily of estate and business planning, probate and real estate law. He served two years as president of the LPEF Board, and we even used a loophole in the bylaws to keep him on for a seventh year of service. 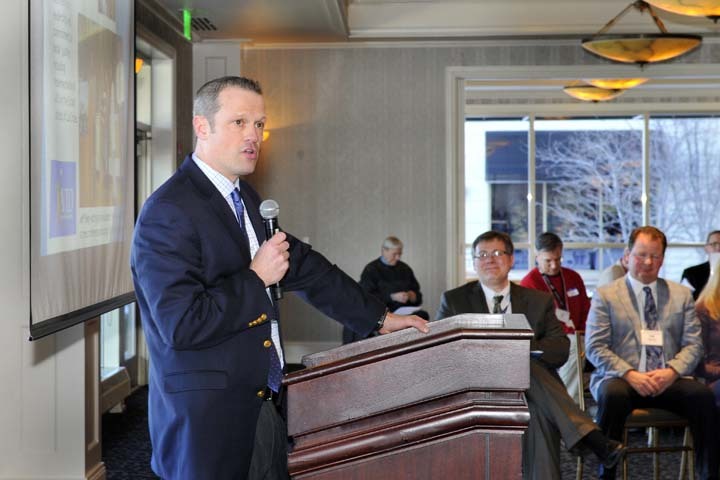 The following awards were presented on Jan. 18, 2016 at the Foundation’s Grants Award Luncheon. This award is presented to a business with a deep commitment to public education in our community, including support for the La Crosse Public Education Foundation. 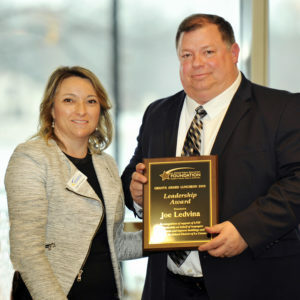 The 2016 recipient is one of LPEF’s Corporate Investors, The Insurance Center, which was founded by Tim Johnson’s father in 1972 and has grown to 12 offices, including 10 in Wisconsin. In addition to support for LPEF, The Insurance Center has supported more than 40 other community organizations with a special emphasis on children’s charities like Big Brothers & Big Sisters, Boys & Girls Club, Children’s Museum, Family & Children’s Center, Parenting Place and many others. 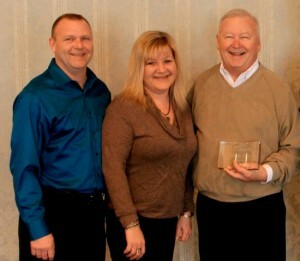 Accepting the award was Tim Johnson, president of The Insurance Center. 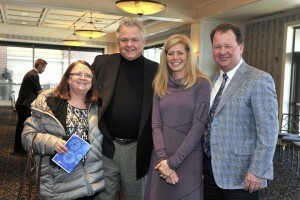 He was joined by his wife and co-owner, Laura Johnson, who is a former member of the LPEF Board. The Leadership Award is presented annually to an individual who has demonstrated great service, passion, and leadership in support of our public schools. The 2016 recipient is Jeff Fleig, principal at Central High School. Jeff has worked at La Crosse Central the past 12 years and is in his fifth year as principal. Last year, Jeff was the featured presenter at this luncheon, introducing all of us to AVID – a college-readiness program that is making a major difference in the lives of high school students at both Central and Logan high school. Jeff played a key role in bringing AVID to the School District of La Crosse and serves as district director for the program. But Jeff’s leadership efforts go well beyond AVID. He is a true “learning leader” for his staff at Central High School, continually looking for ways to build the capacity of individual staff members by building on their strengths. He embraces his leadership role with students, helping transform the climate at Central, whether it’s through “lip dub” shows or his commitment to diversity and social justice. 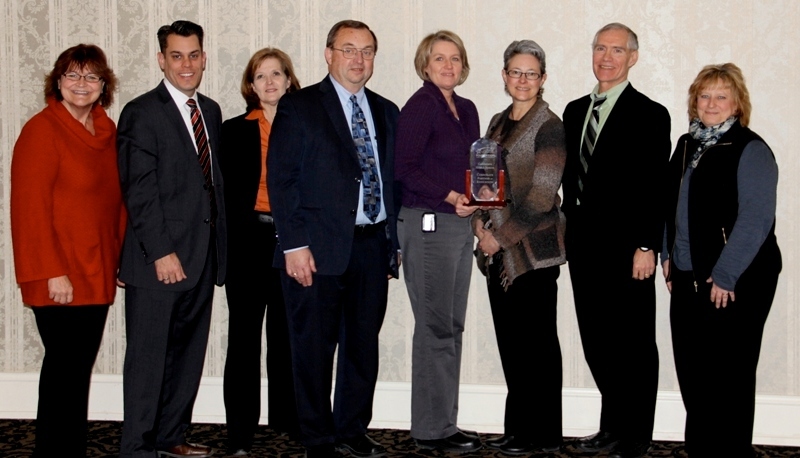 This award is presented in recognition of service to the community and to the La Crosse Public Education Foundation. The 2016 recipient — Jerry Kember — is one of those rare individuals who generated respect, and even love, from the District staff, even while setting high expectations. He began his career in 1970 and since that time has taught music to elementary, middle and high school students. He spent 22 years as an administrator in the School District of La Crosse, including 10 years as Supervisor of Fine Arts, finishing with eight years as superintendent of schools. He built a strong team and was known as a collaborator and servant leader. Since retirement from La Crosse Schools he has been teaching at UW-La Crosse and Viterbo University. He serves on various boards, including chairing the La Crosse Promise Future Center Committee. 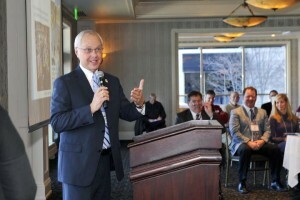 In 2010 he was recognized as Wisconsin’s Superintendent of the Year. 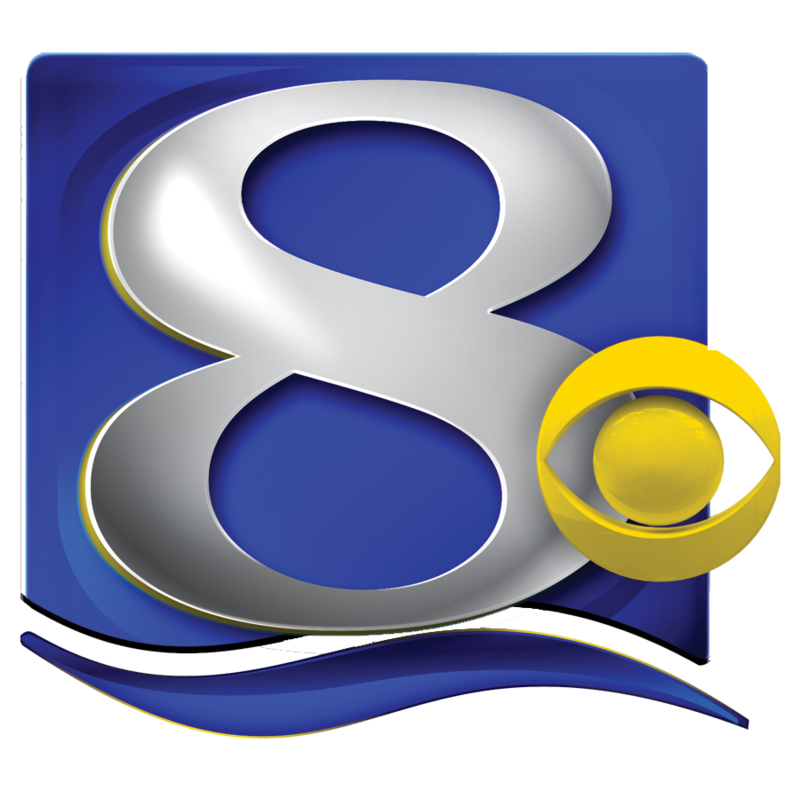 In 2011, he was presented the La Crosse Area Chamber of Commerce’s Community Service Award and that same year was selected to represent La Crosse as the Oktoberfest Festmaster. And finally, in 2013 Jerry was named the Boys & Girls Club 2013 Advocate for Youth. He annually helps LPEF with the Charlie Miller Bowtie Classic Golf Outing and Knowledge Open, where he relishes the role of selling raffle tickets and promoting the mission of the Foundation. 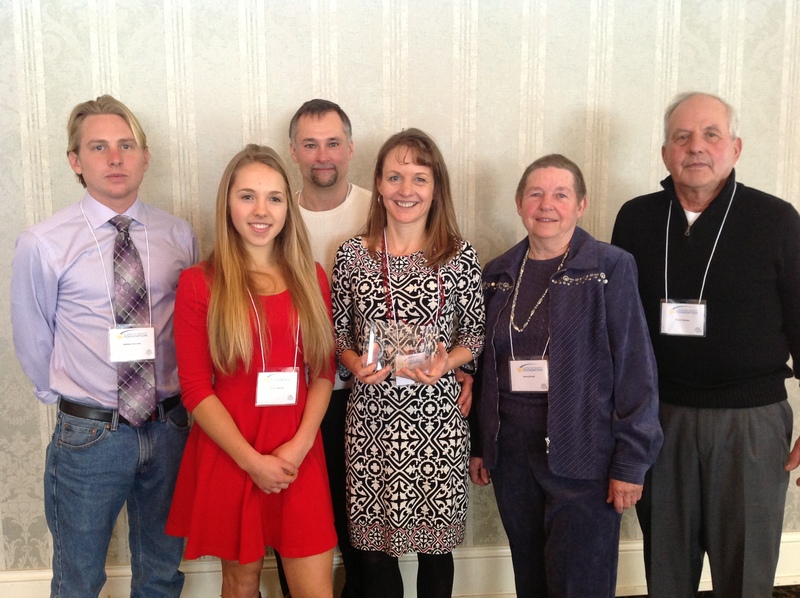 The following awards were presented on Jan. 19, 2015 at the Foundation’s Grants Award Luncheon. LPEF Board President Greg Bonney presents the Corporate Partner in Education Award to Dale Walter, president of Bremer Bank La Crosse. This award is presented to a business with a deep commitment to public education in our community. While the 2015 recipient is a relative newcomer, many of its key leaders are not. Bremer Bank La Crosse has already demonstrated an impressive commitment to the community, supporting the efforts of its majority owner, the Otto Bremer Foundation, to invest a large portion of bank profits back into local communities. The Otto Bremer Foundation has awarded a $125,000 grant to support implementation of AVID in the School District of La Crosse. Accepting the award were Dale Walter, president of Bremer Bank La Crosse. He was joined by Mark Carpenter, senior business banker, Dyanne Brudos, wealth management advisor, and Ann Abraham, treasury management officer. Leadership Award Winner Steve Michaels with LPEF Board President Greg Bonney. This award is presented to an individual who has demonstrated great service, passion, and leadership in support of our public schools. This year’s recipient is Steve Michaels, principal at Hamilton Elementary/SOTA I and also district director of fine arts for the School District of La Crosse. Steve is an innovative leader and tireless promoter of fine arts in the district – and in the community. He is unwavering in his support of the Public Education Foundation – and frankly, one of its most frequent grant recipients, a testimony to his creativity. He was a backbone to last year’s successful Compassion Project. 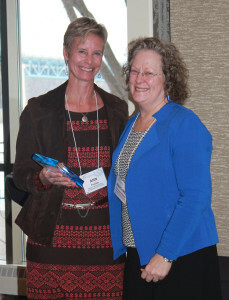 Distinguished Service Award Winner Ann Fowler (left) with Margaret Dihlmann-Malzer. 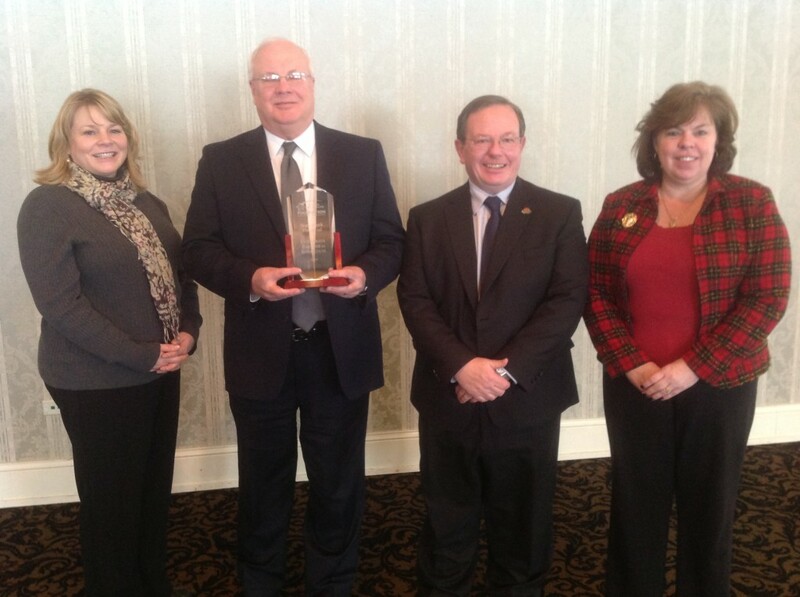 This award is presented in recognition of service to the community and to the La Crosse Public Education Foundation. Ann Fowler has just completed six years on the foundation board, where she served on nearly every committee and also as board president. She too was a driving force in the Compassion Project and continues to lead efforts to keep the spirit of the project alive. She has been willing to take on any project – but hesitant to take any credit. She is active in the community in many ways, including as a volunteer in schools, in the Lincoln PTO and now at Logan High. Jodi Ehrenberger, Bruce Norgaard, Wayne Oliver, and Andrea Nerby of State Bank Financial receive the 2014 Corporate Partner in Education Award. 2013 Corporate Partner in Education Award: Gundersen Health System Sue La Crosse, Mason Quackenbush, Karol Fox, Jerry Arndt, Sheila Chapel, Lisa Sauer (LPEF Board Member), CEO Jeff Thompson, MD and Sarah Havens accept the award given for Gundersen’s sustained partnership efforts with the Foundation and the School District of La Crosse. 2013 Margaret Dihlmann-Malzer Distinguished Service Award: Magaret Dihlmann-Malzer For her long-term and devoted service on the Foundation board and for her deep commitment to public education in La Crosse, Margaret received this new award, which shall be given annually in her name. 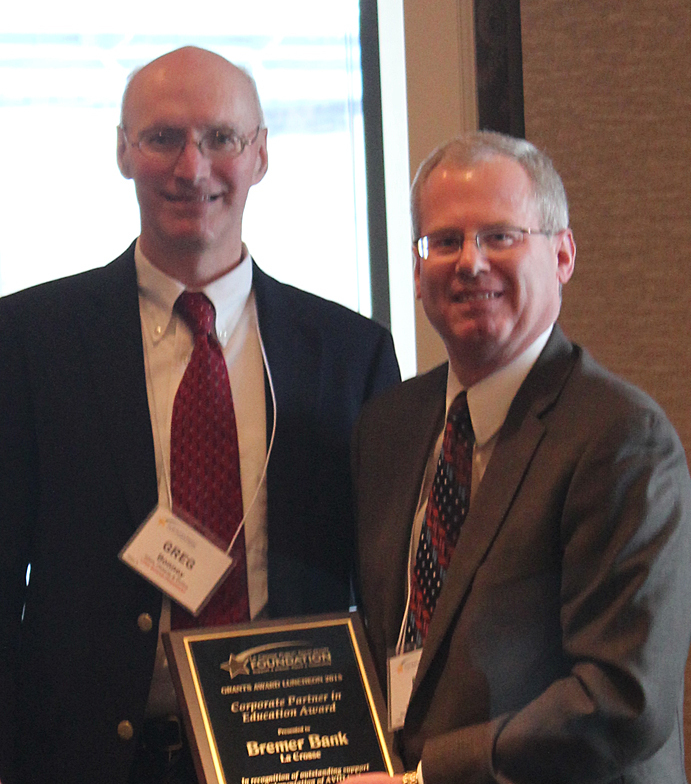 Pictured here with Foundation Executive Director Timothy Riley (right) and former Executive Director Geva Thole (left). 2013 Leadership Award: Randy Eddy, Sr. For his leadership in establishing the Randy Eddy Mathathon and for his tireless advocacy of public education, Randy Eddy Sr. (right) was recognized with the Foundation’s Leadership Award. Pictured with his children, Randy Eddy, Jr. (left) and Tonia Eddy.